I have no doubt that like every other women out there you’ve attended lots of kiddushim, bar and bat mitzvas, engagements etc. So many times the dessert table has an overload of plain old unattractive brown. You know, the usual rugulach, brownies, chocolate cake, cookies and anything else your friendly neighbors decided to whip up. Granted the tablecloths, napkins and other paper goods may fit a color scheme but its hard to get the desserts to match. Keep reading of you are interested in an easy way to dress up some cake pops and add some much needed color to any event! These amounts should give you 10 finished cake pops. You may change them to fit your needs. This is a pretty easy flower to make. It requires a circular shaped puncher. If you don’t have a puncher, you can use anything round that will give you a 1.5 cm and 2 cm wide circle. Roll out at least 50 grams (approx.) of your colored fondant. Make it 2-3mm thick. Roll fondant to a 2-3mm thickness. Punch out two circles, one large and one small. I used 2 cm and 1.5 cm punchers but its okay if they aren’t exactly that size. Just make sure one is smaller than the other. Place the finished circles on your foam pad. With the ball tool press around the outside of the circles applying a little pressure as you go around, making sure the ball is resting half on the fondant and half on the pad. This motion will smooth and thin out the edges of each circle to create a ruffled effect. Next, place the smaller circle in the center of the larger.Use a bit of water for gluing them together. To form the gold center, simply take a small amount of white/light colored fondant, role into a ball small enough to fit in the center of your flower, and prick holes with a toothpick.This will give it some realistic texture. Use a soft paintbrush to apply the dust. Then glue in the center of the flower with a bit of water. Repeat the above steps for the rest of the flowers. Melt approx. 100 grams of white chocolate (or dark if you prefer) in a pastry bag. Stop the microwave around every 30 seconds to mush around the chocolate. This will prevent it from burning. Don’t over melt it or it will begin to harden again. Cut a small hole in the tip of the bag. Slowly and evenly apply pressure to the bag while you squeeze the chocolate on the cake pop. (See picture below.) Let the chocolate dry. Make sure to apply pressure evenly when squeezing! 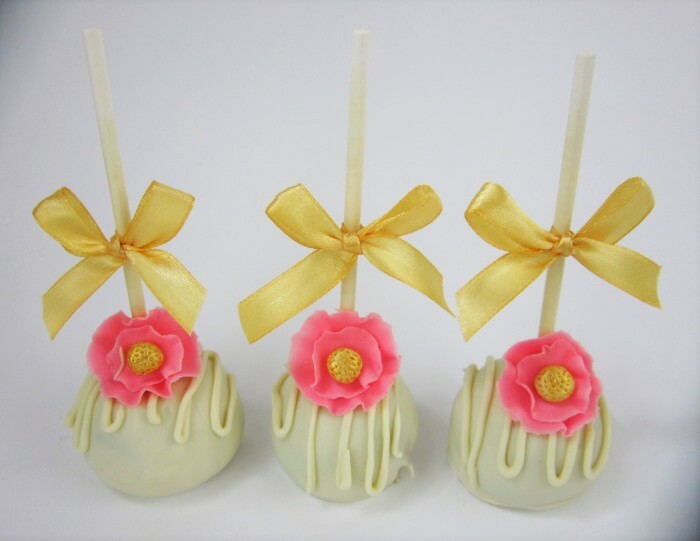 Squeeze a dot of chocolate on the cake pop and place the flower on top. TIP: Melted chocolate works amazing as a glue! it hardens quickly and really holds things together. To add the final touch, tie a bow towards the top of each stick using a 20 cm long (approx.) piece of ribbon. Cut the edges off if there is too much excess. Any questions? Just post them in the comments below! They look so easy to make. I dont have a foam pad though. What else could I use instead? Could I just do it in the palm of my hand? Where can I buy the supplies? I live in Jerusalem. They should have everything there. Hello! This is absolutely stunning!!! I once tried to make cake pops but the recipe didn’t even work. They flattened and crumbled Maybe you can put a good recipe on your website for those of us who don’t live in the holy land… yet! Btw, you don’t know me but your sister was my sister’s madricha a few years back in seminary 😉 So, word’s getting around about your cake decorating! Hatzlocha Rabbah U’Merubah!!! I may do a cake pop recipe in the future. Make sure to sign up to the blog so you dont miss it!